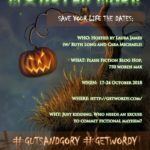 So even though I’ve not written for a very, very long time I agreed to host the Monster Mash – didn’t really think it through that I’d have to write a story as well LOL. Anyway as I’m still struggling with the written word I decided to revamp and recycle a couple of old tales. She didn’t know how long she had been trapped in this barren room, days and nights melded together and became one. At the beginning she had tried to use the delivery of food to keep track of time, but the small shutter at the base if the door would open at random intervals delivering the same meal time and again. A lesser woman would have broken by now, but Sian was determined to see this through to the end, to survive and when she did her father’s enemies would pay a heavy price. Without warning a large timber wolf was pushed through the door. Spotting the only thing in the room it could take its anger out on, it slowly made its way towards her on silent paws, all teeth, claw and power. Sian backed towards a corner, knowing that the walls wouldn’t save her, yet taking comfort from there presence. Looking into the wolf’s eyes, she realised that it was more afraid than angry; it, like her, had been pulled from a place of safety and thrust into danger. No longer concerned with her own well being, Sian moved towards the wolf, singing softly at first but allowing the tune to build in momentum and magic. The wolf stopped, cocking his large head to one side, he sat seemingly mesmerised by the music that now surrounded him. The growling at the back of his throat quietening down until without warning, he lifted his head and howled, joining his voice to that of Sian’s. It didn’t take long before the wolf became restless. Sian watched as he paced the floor, large soft paws pounding the wood in the same pattern over an over, the occasional pause to sniff the air. She couldn’t work out what had upset him, food had been delivered in silence as usual, nothing out of the ordinary had happened. Then she heard it in the distance, a low rumbling growing in momentum until the noise surrounded the room they were in and the walls started to shake. Without warning the roof disappeared allowing wind and rain to batter Sian and the wolf, but with no where to hide they cowered together in a corner for comfort. The wind grew in ferocity, whipping round the room creating a mini hurricane in the confined space. Sian knew without the wolf to hold on to she would have been thrown round the room like a rag doll. A crack appeared in the wall opposite and, as she watched, it grew larger until a section disappeared, sucked into the void that was the darkness outside. The wolf was up and away before she could do anything, he had sensed freedom and taken his chance, she tried to cross the floor in his wake but wind and rain kept buffeted her from all sides preventing her from gaining much distance. Shielding her eyes from the onslaught she was unaware that the wolf had returned, until a large soft mouth was clamped round her wrist and with such gentleness started to drag her from the room. Trusting the wolf with her life, she allowed it to guide her forward, away from the room that had been her life for such a long time. Once the storm had passed Sian found that they travelled a good distance from the building and the men that had kept her captive and she was finally free to live her life. Sometimes the monsters were saviours. Ah, love that the wolf comes back for her! Excellent tale. Wolves are the best. (like Wolf in Stephen King’s The Talisman). Lovely description of the wolf, sometimes the monsters are the best!